Gail McInnis Productions is proud to offer premier costume designs tailor fit for show choirs and performing groups. 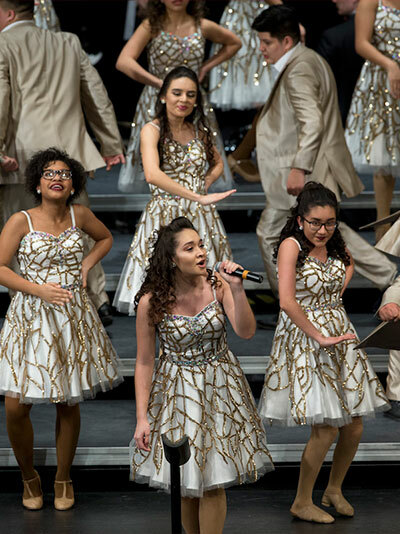 We offer a wide variety of unique fabrics, custom made beaded and sequined dresses and creative costumes to fit the ever-changing show choir world. We offer an extensive line of men's suits and creative custom jackets. As a music educator for 30 years, Gail understands show choir and how you, as a director, need your costumes to function on stage. Gail and Robert offer personal attention to each client. Customer service is a priority in our company! Please check out our galleries to see our work. Contact us to start your creations or choose one of our many samples for the new up and coming season! !